When I was in intermediate and middle school, I read a lot of books. Mostly books based on video games like Halo, Gears of War, and Starcraft, but I did branch out on occasion, such as Christopher Paolini’s Inheritance Cycle(Eragon, Eldest, Brisingr, and Inheritance). I could sit down with one of those books and read for hours on end. I’d take it to school with me and use it during my reading class. It was so easy to just pull it out and read. But that’s not the case anymore sadly. While reading through the aforementioned “Inheritance” I slowly began to fall asleep. The book was interesting, and the writing was no different from the previous three, but I just couldn’t keep myself from nodding off. I tried with other books and got the same result, even with ones I had read three or more times before. Needless to say this became concerning to me because I loved reading. But there was a light at the end of the tunnel. In 2012, on a very dreary day, I decided to take a look at visual novels. A form of game from Japan, you take a book, take all the information out of it pertaining to location, characters, all that and turn it into imagery that you can actually see rather than having to imagine. A musical track gets added and perhaps there’s even some voiceover. The only text on the screen is usually what the main character is thinking or saying, sometimes in first person and sometimes from third person. While there were a few notable options I could have picked(Back in 2012 there weren’t many official English releases of visual novels, at least not on Steam where they were easily noticeable. ), I ended up going with an indie visual novel called Katawa Shoujo(Do NOT translate that name, it will give you the completely wrong impression of the game.) which had its own website with download links and even the full soundtrack. I had heard a few good things about it so I decided to give it a try. Being as self-conscious as I was(The game does have H-scenes, but they can be toggled off in the options menu whenever you wish. ), I would turn my laptop, and later computer monitor, away from the couch where my mother would be sitting so that only I could see the screen. Cute anime girls graced the screen, colorful and well drawn environments appeared behind them, and beautiful music flowed into my ears. It was the start of an adventure the likes of which I had never experienced before. For hours upon hours I went through the game. Hours turned into days and I played through all five paths of the game, including the two side paths that go nowhere. The story was very well written and the music helped the mood along. To give you some context of what I was experiencing, Katawa Shoujo is a game set at a high school for special needs children, specifically that of the physical variety. Missing limbs, deafness, blindness, the whole gamut. The main protagonist, Hisao, suffers from Arrhythmia, a heart condition which he only learned of after a girl confessed to him and he suffered a heart attack. And so at any moment he could have another attack, and as such the 24/7 medical staff of Yamaku Academy were very much needed. Upon arriving there, he meets the eccentric school nurse, his dorm neighbor Kenji who is 90% blind and a conspiracy nut, a few teachers, and five girls each with their own unique condition and personality. Through your choices throughout the first chapter of the game, you’ll score invisible points that decide whose path you end up on, though there is a chance that you’ll bomb with all of them leading to one of the dead end paths I mentioned earlier. The options, of course, are Lily(100% blind), Eri(prosthetic legs below the knee), Hanako(burn scarring), Rin(No arms), and Shizune(Deaf/Mute) who communicates via her best friend Misha who knows sign language. On the outside it may sound like your typical dating sim with a disability twist, but it goes so much deeper than that. It explores how each girl copes with their particular disability, and in turn how the main character grows to accept his new life with his condition. The story evokes sympathy and understanding from the player and the stories are emotional. It’s also one of those visual novels where the H-scenes, if left on, actually do add something to characters themselves. They reveal quirks and other aspects of the characters personality. I won’t exactly go into detail, but I did leave the scenes turned on for this very reason. And what prevents these characters from being the same, or their stories from being the same, is that they were all written by different people. Some of their stories do overlap, but for the most part are completely isolated with the other girls except maybe one more or less vanishing from the story. Likewise, Kenji, who plays the role of best friend, has different scenes in every route. So if you play all of them, you get a more complete picture of who Kenji is despite his eccentricities and you learn more about his backstory.). And throughout all of this you can see the characters, hear the music, and only have to read the text at the bottom of the screen. With so much going on, it’s much easier to keep my attention focused on the novel and not fall asleep(I did try to use music while reading normal books, but it never worked.). This would continue with the second visual novel I engaged with. Fate/Stay Night is probably one of the most well known visual novels in the industry. Originally released in 2006 by Type-Moon, the game has a choose your own adventure feel to it where you can make decisions from time to time that influence the flow of the story, although while there are three story paths, you have to play them in a specific order. The Fate route, centered around the servant Saber is the first. 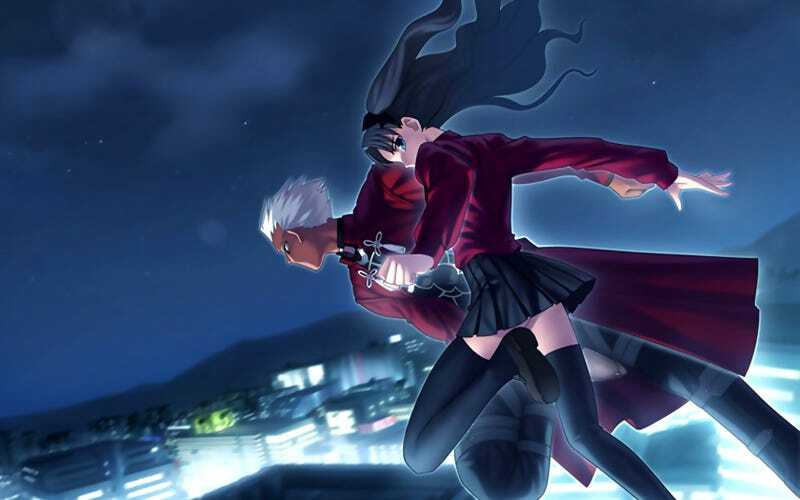 The second route, Unlimited Blade Works, is focused on heroine Rin Tohsaka and her servant Archer, while the third and final route, Heaven’s Feel, is tied to character Sakura Matou. The game was never officially released in the US, and as such fans took up a multi-year task to fully translate the game into English. The patch works with both a legal, disc copy of the game or torrented versions of the game. It works with the both the original 2006 release, the all ages Realta Nua release, or a special torrent-only(To my knowledge.) combined version that consists of mainly Realta Nua content including voice acting, but has the H-scenes from the original release spliced in to create a more complete Fate/Stay Night experience. All in all, I must have spent days on just the Fate route of this game. At some point I did fall off the wagon and haven’t returned to it since, but I do plan to eventually go back to it and finally finish the Fate route and experience the other two. And like Katawa Shoujo it held my interest and not once did I ever nod off while reading it. After that I dived head first into other visual novels. Kanon, Clannad, Higurashi, and The Fruit of Grisaia. All of them were engaging and not once did I ever fall asleep. At least, as far as I got in any of them. I have a bad habit of starting them and never finishing. Fruit of Grisaia is the one I’ve gotten the closest to finishing and that was on my second attempt. And now, during the current Steam Summer Sale, I’m buying up even more visual novels like crazy, and I’ll probably never get to them. But at least I know that if I ever do, I’ll actually be able to read and enjoy them without dozing off mid-chapter.